Now that you have knitted your project as long as you want, it is time to cast off, or remove the stitches from the needles. I have 11 stitches in this demo. When you are casting off you are working with two stitches. So knit two stitches. 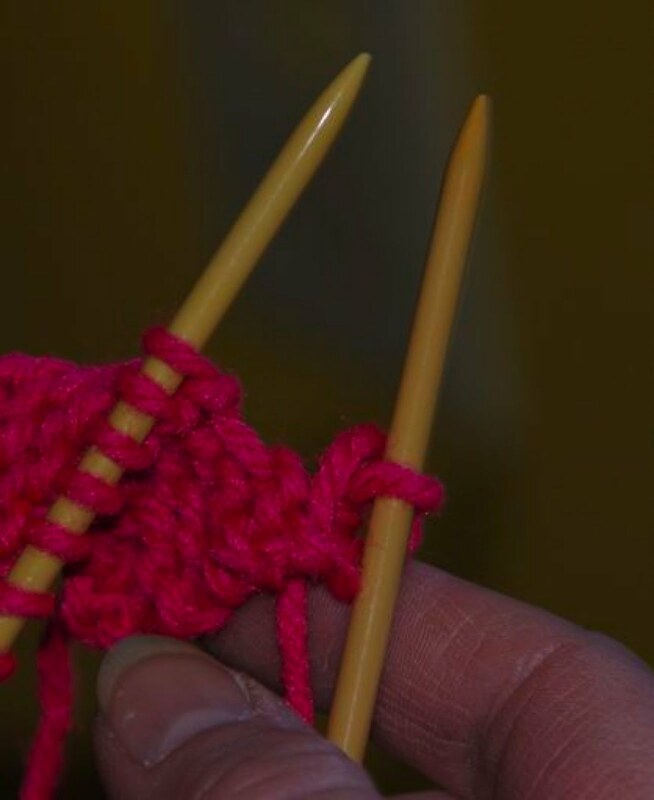 There are now two stitches on your working needle and 9 on the holding needle and a bit of a knitted bridge between them. The stitches on your working needle I will call, from tip down the first stitch and second stitch. Stick the button of the working needle which has two stitches on it, firmly in to the belt. You do not want it to wiggle on you. To cast off a stitch, you will move the second loop/stitch from the tip of the working needle up and over the first stitch. You will end up with one stitch on the working needle. Remember, how I hold and control the stitches is a starting point. By now you may have your own system. In the picture above I am using my ring and little finger to control the stitches on the holding needle, my middle finger the first stitch on the working needle and using my thumb and first finger to move the second loop up and over the first stitch and off the needle. You now have one stitch on the working needle. You have cast one stitch off the working needle. There are still eight stitches on the holding needle. Knit one more stitch. You again have two stitches on the working needle. Repeat these steps until there are not stitches on the holding needle and one on the working needle it is time to cut the tail. Some thought in to how long to cut the tail is needed. If you have knitted a headband and will be sewing the first row to the last row, you will want to cut a tail that is at least three times as long as the area you will be sewing. This is a rule of thumb that has served me well for any two pieces of knitting that I am going to sew together. The six inch tail will give you enough yarn to sew in to the edge of your knitting and make the tail disappear. The needle you want is the ones with the huge eye and dull point. You will find these in knitting tools area of your knitting or other store that carries knitting supplies. It can be plastic or meta. Find a way to secure the needle so that it holds still. 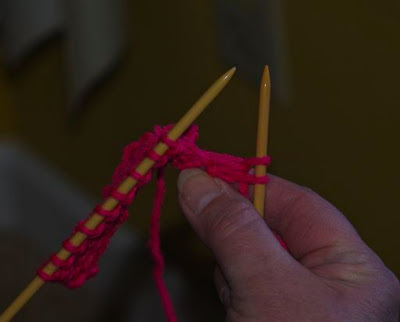 About an inch or two from the end fold the yarn in half and pinch the fold between your thumb and first finger with about a quarter of an inch of the fold sticking out. Put the fold through the eye of the needle, then push it through a bit more until you can get a hold of it and pull on the fold until the tail is through. Pretty slick I think, an original idea but works real neat. If the project is small enough to pull through the belt on your leg this would hold the two parts together as you sew. Other wise I think I would pin on part to a pillow or maybe a padded ironing board, then line up the second part to be sewn to the first and sew the seam. You I think will have figured this out or been shown a better way. I hope these last few posts have helped get you started. I would suggest you keep your first one hand knitted project to show children and grandchildren and hopefully students. First projects are full of problems but almost all of them look rather strange for the first few inches. With in these first few inches you have learned to cast on, knit rows, what the yarn should look and feel like as you knit for just a few. Most of all don't give up just yet try a head band or narrow scarf. I would keep to the non textured yarns until you have a smooth, even edged project. 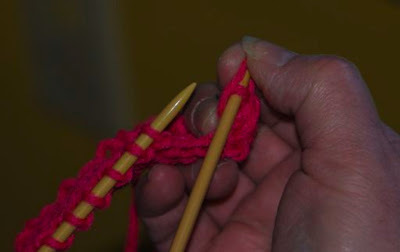 There are two basic stitches in knitting, the knit stitch you have been doing and the purl stitch. I'll cover the purl stitch in the next section. Until then travel the inter net, look at books in the library. When at the library pull out a lot of books off the shelf take them to a table and look through them until you find one or more you understand. Check these out, then after some delightful hours at home making sure these are understandable for you, make a list, check it twice and indulge your self and buy the best. I suggest you look for a stitch book. One full of stitches with directions you under stand. I will tell you now I like the books by Barbara Walker. The inter net has a lot of free patterns my favorite source of knitting information at this time is Ravelry. They have some nice ways to narrow the search for patterns. Once you find one you may be able to check out what other knitters thought of that pattern and how they changed it. While cursing the Internet, look for directions for using a knitting belt. A knitting belt goes around your waist. This may be easier for you. 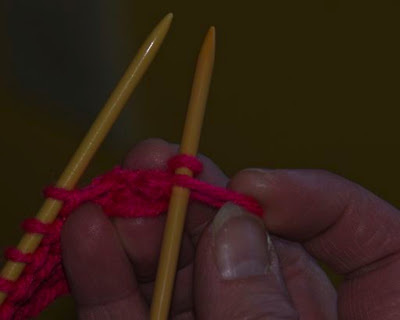 It uses double pointed needles so look for double pointed needles to be use with a knitting belt. When you are ready to knit a sweater I think the combination of knitting belt and double pointed needles may be easier than my very basic belt and towel set up. Which is just to get you started and a starting point to find your own system. I do strongly suggest you find as many knitting groups in your area as possible. The groups I belong to are wonderful. I think we laugh as much as knit. I bet there will be someone at one of them ready to give helping you their best shot. Most of all bravo from me. Lynne a mom with a geology degree that knits.